A leisurely gourmet dinner by candlelight, accompanied by fine wine or spirits—ah, nothing beats this date night classic. 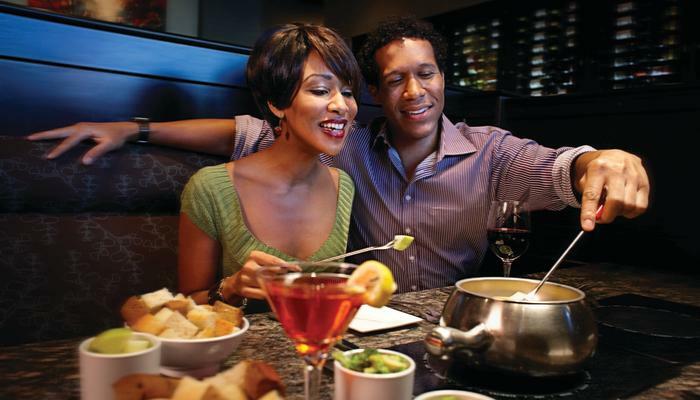 For Arlington fine dining options, enjoy Restaurant 506 (sophisticated fare in an intimate venue); Piccolo Mondo (memorable Italian dishes and a cozy piano lounge); The Melting Pot (fondue fun and to-die-for desserts); or The Keg (classic steaks and seafood). Between picnic-perfect food stores like Whole Foods and Sprouts and more than 90 parks and green spaces in Arlington, it’s not hard to put together a lovely outdoor excursion for you and your special someone. Local park destinations especially worth checking out include River Legacy Park, Veterans Park, O.S. Gray Natural Area, and Richard Greene Linear Park, just to name a few. Not only is the UTA Planetarium a wonderful option for anyone who wants to plan an out-of-this-world date night—literally!—it’s also one of the most affordable date options, ringing up at just $12 a couple per show. Head to College Park Center afterwards to catch a Dallas Wings or UTA Maverick game. Book a weekend stay at one of Arlington’s upscale hotels or charming bed-and-breakfasts and enjoy room service, spa treatments, and on-site dining—and perhaps most importantly, daily maid service. Seriously, who doesn’t love daily maid service? Bonus: Take the Arlington Trolley from participating hotels for curbside delivery to a Rangers game, Cowboys game, Six Flags adventure, Downtown Arlington outing and more. The Levitt Pavilion is a wonderful dating destination for anyone who loves the idea of music under the stars—plus it’s free, offering more than 50 outdoor concerts each spring, summer, and fall. Bring a blanket or a chair and pack a picnic dinner (don’t forget the wine)—or you can buy food and bevvies on site from one of the Levitt’s vendors. Who says that a date night always has to drip with wine, roses, and moonlight? If you and your sweetie like to be active, you can show off for each other (and maybe stir up a little friendly intra-couple competition) at action-packed Arlington destinations like Putt-Putt Golf, ICE at the Parks, Arlington Skatium, Dyno-Rock Indoor Climbing, Dave & Buster’s, or K-1 Speed. Does a laid-back night of pool, darts, cold beer, and live music sound like you and your honey’s idea of one fine, chill evening? If yes, your next dating destination should be one of Arlington’s diviest, sportiest destinations, like Stumpy’s Blues Bar, Milo’s, Hooligan’s, J. Gilligan’s, Sherlock’s, or one of these joints. Arlington’s chock-full of quirky neighborhood eateries and ethnic gems that are guaranteed to add some flavor to your restaurant repertoire—so why not go exploring for a new favorite restaurant that just might become your next “our place”? Add a little class and sophistication to your dating night portfolio with an outing to an Arlington Museum of Art exhibit or Symphony Arlington or Theatre Arlington performance, perhaps followed up afterwards by a late night bite at a Downtown Arlington watering hole.